For those without comedic tastes, the so-called experts at Wikipedia have an article about Moa. The Moas are large, flightless birds that are native to New Zealand. They are unique in having no wings, not even small wings, unlike other ratites. Their lack of wings is thought to be a curse from God because they are such evil and vile creatures. Moa are often silent and can seem quite innocent, even cute. However, once their target's attention is drawn to them they'll often attack, breathing fire from their mouthes or crushing their aggressors between their deadly jaws. They will also attack when provoked, provocation including comments such as "look at that stupid Moa", "oh, it's just a Moa" or "Come get some Moa". The Moa is also an annoying and very useless creature. It'll often go on about nothing that nobody likes to hear about and make no contribution to society. It is very opinionated and will not shut up if it is talking. This is often used in conversations with annoying people such as preppy cheerleader-type girls. "You're such a Moa." "Shut your mouth you stupid Moa." "Go away Moa." 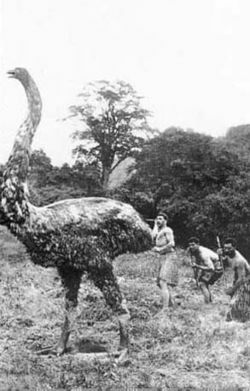 The Moa is often found in everyday life, even working in a job. It is often seen sponging off other people. Funnily enough the moa will allow people to criticise or insult it (although it will not care) and not attack them if it is talking or doing work. You guys are no moa fun. Although moa attacks on humans are common, its diet is unknown. It is, however, believed to have acquired a taste for Maori flesh. For days it can seem they're just hiding behind a bush without eating or drinking, only to leap out and devour a passing Maori without warning. A moa's stomach has never been dissected because all the scientists that try to catch a moa end up with a moa beak through their skull, which is knowledge popularised by the saying "That's about as fun as getting beaked through the head". The moa's habitat is one where it can hide itself. This can mean underground, in buildings, behind moa statues or in the bush. 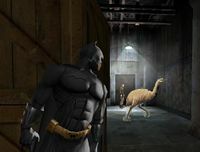 You never know when a moa might show up, so you'd better be careful. Look carefully into every room before entering! These are the attack patterns of the moa. Hidden phase: The Moa is hidden and/or unseen. Innocent phase: The Moa is viewable and may initiate conversation. If this happens attack phase three is cancelled unless provoked by insults, or poor response to Moa Jokes. Attack phase: The Moa opens its mouth and attacks with fire breath OR jaws. Usually their eyes often look angry, the head becomes inflated and has an angry expression on its face in this phase. Be careful, or you will end up beaked through the head. This page was last edited on 6 January 2018, at 22:09.